On space flights in the past, the components of breathable air, oxygen and nitrogen, were brought up in canisters. NASA’s Johnson Space Center tested means to recycle air and water used by volunteers sealed in an airtight chamber with a limited amount to breathe and to drink. Mechanical and chemical means were being used to recycle all the air and water, including urine. Past tests involved using wheat plants to recycle breathing air, and by 1997, sixty and ninety day tests using plants and/or physiochemical recycling were planned. In a life-support system for the space station designed at NASA’s Marshall Space Flight Center in Huntsville, Alabama, carbon dioxide is reclaimed from the exhaled air by a concentrator. The 95-percent-pure carbon dioxide is burned with hydrogen in a carbon dioxide reduction device, yielding water and some waste products, either carbon or methane. This water is used as drinking water on the space station. Some water from the hygiene system, dirtier water, is put in an oxygen generator, an electrolyzer that breaks it down into its two components, hydrogen and oxygen, by electrolysis. The oxygen is to be fed back into the cabin, closing the cycle. 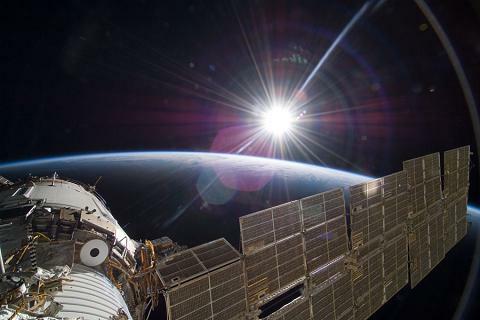 The hydrogen is used in the propulsion system to keep the space station at the proper attitude and to reboost it into the proper orbit as the orbit decays. Oxygen requirements are about 1.8 pounds per day per person. On past space flights, carbon dioxide was recaptured but not reused. Initially, the Soviet Union used a multi-step chemical recovery system to obtain oxygen for its extended space flights. But they switched to an electrolyzer-type process, with the supply vehicle, Progress, bringing up water that is then electrolyzed. U.S. missions have also supplied breathable air.